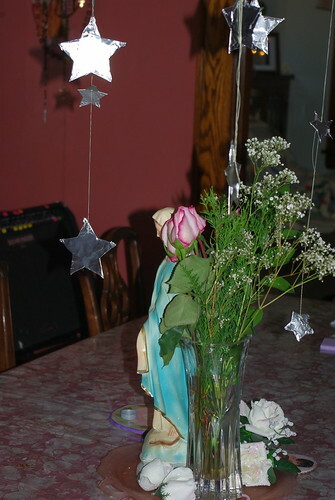 Mary's birthday is celebrated exactly 9 months after the Feast of the Immaculate Conception. 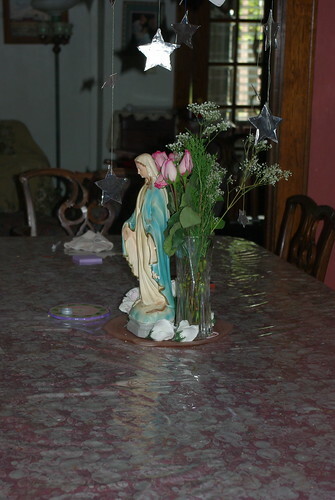 Mary's Birthday is one of only three that we celebrate during the liturgical year, the other two being John the Baptist and of course Jesus! The story of Mary's birth is somewhat familiar. Joachim and Anne were two holy people, married for many years without being able to conceive a child. But by remaining faithful to the Lord, they were rewarded by finally conceiving a child- the little girl who would become the Blessed Mother. The story goes that the Angel Gabriel appeared both to Joachim and Anne separately, telling them the good news that they were pregnant, and when Joachim and Anne found each other to share the news they each already knew!! 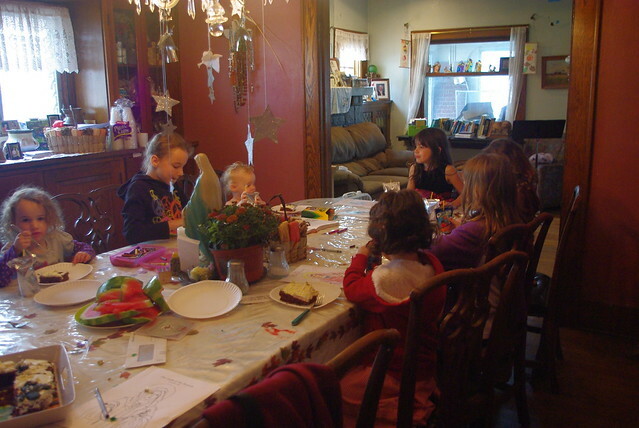 Usually for Marian Feast Days the kids and I make a "white dinner." Everything is white in honor of Mary. White chilli is a nice meal to make this time of year when soccer and cross country and all of the other activities are going in full swing. Just pop the chicken and spices in the crock pot and go! 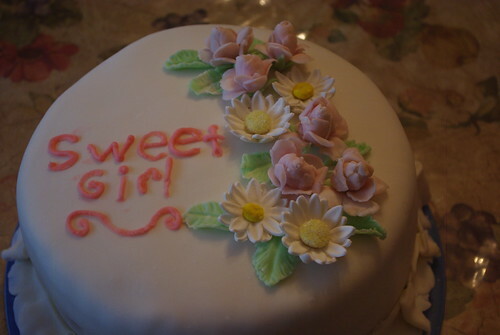 Of course a lovely white cake for desert is a natural! 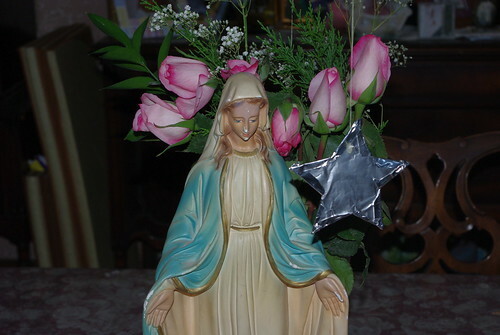 For the past couple of years we have decorated with homemade foil stars, 12 of them, hung around our statue of the Blessed Mother. 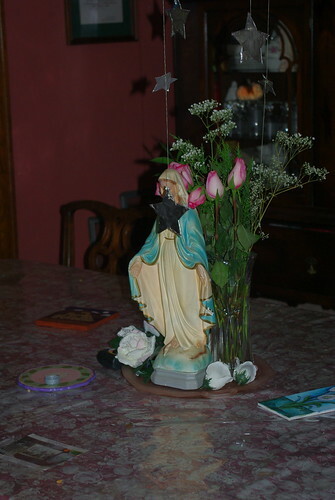 This statue is one from my family home. I remember it in my grandmother's house when I was growing up and then I got it after my mom passed last year. I'm glad my children are going to grow up with her. 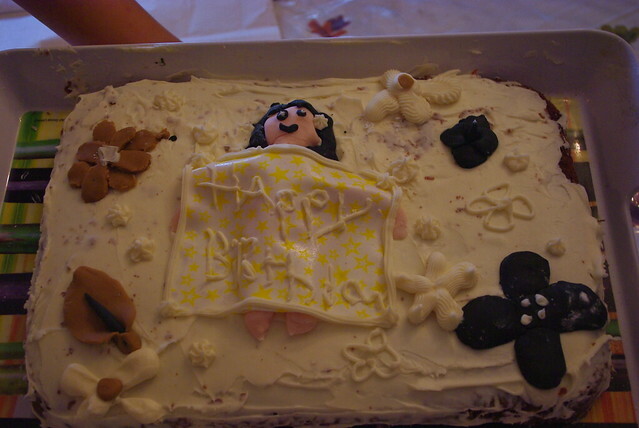 Angel holding a Happy Birthday Sign on Mary's cake. 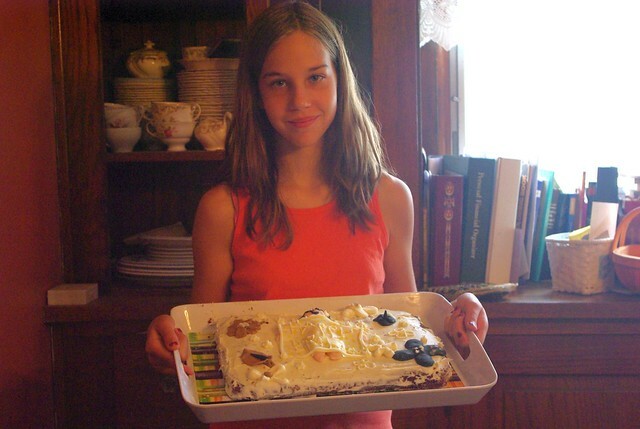 Izzy made this cake last year before her cake class! 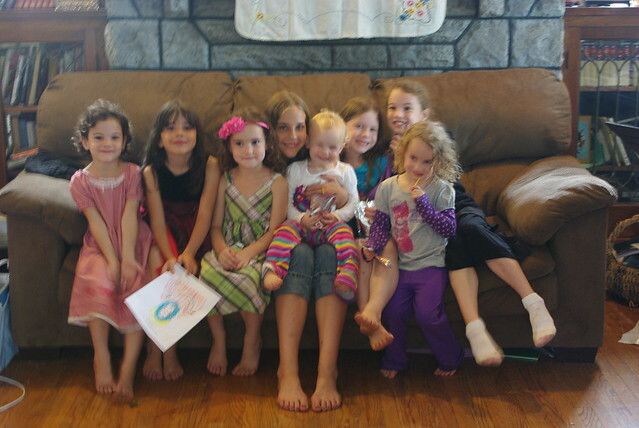 Last year we invited a family of six little girls over to the house to celebrate! We read Mary My Mother (by Fathe Lawrence Lovasik. We read about traditions in the world today in Catholic Traditions In The Home And Classrooms: 365 Days To Celebrate A Catholic Year . For example, in France this is the day for harvesting the best grapes and bringing them to church. This is also the start of the "bringing down" in the Alps, as ranchers bring their herds down from the summer pastures for safe keeping in the winter. We found France and the Alps on our world map! But this year is a little different than last year or even the year before! because today my sister is getting married again. What a nice day to get married - on a beautiful Marian Feast Day! Her husband passed last night. Could you keep her in your prayers? I don't remember her, but sure, I'll pray for her.